Salkantay snow is really exceptional, located less than fifty miles northwest of the city of Cuzco in south central Peru. Salkantayis the highest mountain of the Cordillera Vilcabamba. Because of its proximity to the city, Salkantay is easily accessible and is climbed frequently. Join us on this incredible Hiking Tour to Machu Picchu. Book early. 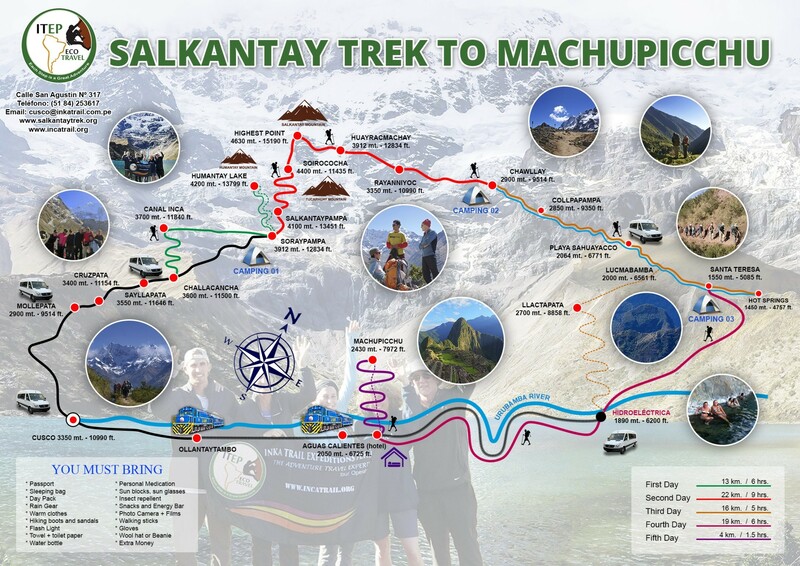 The Salkantay Trek is a famous trekking in Cusco and is a great alternative to the Inca Trail to Machu Picchu. You going this hike, you will see some of the most beautiful places in Cusco and see the snow-covered mountain. The altitude of Salkantaymountain is 20,574 feet (6,271 m). You will have the opportunity to see beautiful landscapes with a variety of flora and fauna, and camping overnight in the middle of the sacred mountain of Salkantay. Connecting the town of Mollepata, Cusco with Machu Picchu, the Salkantay Trek is an ancient and remote footpath located in the same region as the Inca Trail where massive snowcapped mountains collide with lush tropical rain forests. Ready to go? ITEP travel will make it easy to get started! Book now or Contact us to our famous treks in Peru. The setting for the ancient city is absolutely stunning, and the feeling of reaching it by foot over 5 days of such intense physical exertion and the swath of rugged terrain that you’ve since left behind makes the entire moment of standing atop Macchu Picchumuch more rewarding than had you simply taken a train from Cusco and then a bus to the top. trekking and visit Machu Picchu. Cusco, Mollepata, Trail (Cruz Pata, Soraypampa, Salcantay, Huayrac Pampa, Chaullay, La Playa, Lucmabamba, Santa Teresa, Hydroelectric Center, Aguas Calientes), Machu Picchu.